Project BOMs is part of the Project module and is used to attach bills of materials (BOMs) to the project and select the lines that are required to be reserved or purchased. Standard BOMs or project BOMs can be used. BOMs can be edited as long as they are used on one project only, to ensure that one project does not alter bills of materials on other projects. Add BOM: Is used when a BOM has to be found and inserted into the project. Add BOM will show a pop-up with BOMs from the module Bill Of Materials and allow filtered searching. When a BOM is found and inserted, Qty must be entered. Remove BOM: Removes a BOM from the project. The BOM is not deleted, but detached from the project and can always be added again through the Add BOM button. A BOM can be removed only, when the Selected column is not checked. Project BOM Lines: Opens a Project BOM Lines window, where BOM lines can be edited, deleted or added. Print BOM: Prints the current Project BOM to the default printer immediately. Preview BOM: Opens the print preview window that can be found in the separate Print Preview document. Item: Shows the project BOM tree. Qty: The number of BOMs or articles on the BOM line. Qty can be edited as long as the column Selected is not checked. Selected: Must be set when the line is to be prepared for purchase or reservation. All BOM lines can be selected or de-selected by checking or un-checking the parent BOM. Locked: Is automatically set, when the BOM line is purchased or reserved from the module Project BOM Articles. Type Description: Shows the description of the articles type. Description: Shows the BOM line description. Dimension: Shows the BOM line dimension. Material: Shows the BOM line material. Surface: Shows the BOM line surface. Tag: Can optionally be used to tag an item for traceability. 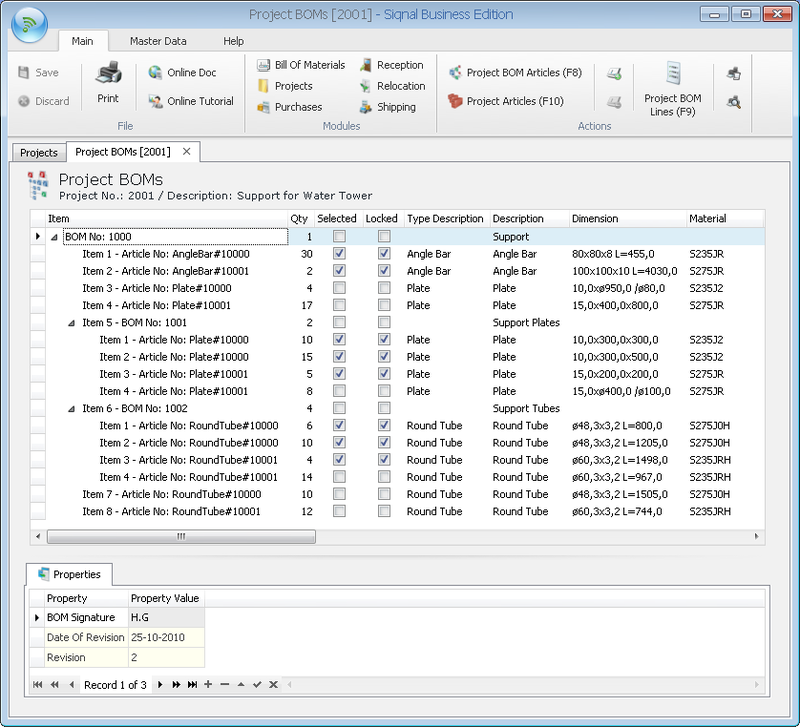 Tag is part of the summation in the Project BOM Articles module. Each unique tag will produce its own new line in Project BOM Articles. Drawing No: Shows the drawing no of the BOM line. Total Weight (kg): Shows the total weight of the line, if weight calculation is enabled. Shipping No: If the BOM line is to be shipped, the shipping number must be selected in this field from a drop-down list. Shipping Qty: The number of items to ship must be entered in this field. The quantity and description will be transferred to the Shipping module. Inquiry No, Ln No, Purchase No, Ln No, Res No, Date, Delivery Date, Available Date, Location, Tag, Comment, Supplier, Contact and Phone No: Read-only information columns. Properties tab: Read-only information on article and BOM properties.